Ships from and sold by astrodeals. love the show. great transaction. Hilarious. The John Travolta vampire skit alone is worth it, not to mention Coneheads...the failed cheerleaders...and a lot more. There are quite a few funny sketches on this, but it's over so quickly! (about an hour?) Wish they'd come out with a 2nd one, since it's been a while, and I'm sure there's enough material for a 2nd dvd. They also should have included some outtakes, etc. on this dvd. There are so many great SNL skits over the years, I'm surprised they barely filled an hour. A great one with Gilda and Martin Sheen isn't on here, and strangely, the "Goth" kids are advertised on the cover and intro but aren't actually on this DVD. Regardless, some really funny skits are on here, and it's a great addition to any collection. It will easily become a "must watch" for each halloween. 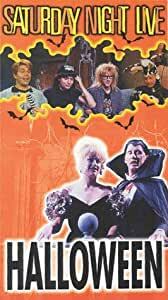 I have purchased the VHS and DVD version of SNL Halloween. Both have the funniest part edited out of Travolta's Dracula skit. I have not been able to find an unedited version on the internet either. It was hilarious! Wish it was a bit longer for more laughs. I would recommend this DVD to anyone who loves Halloween. I love SNL. This was great. VERY FUNNY, YOU WILL LOVE IT.